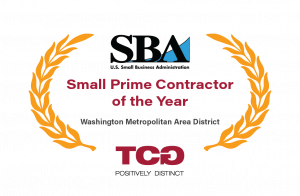 TCG has been named the 2017 Small Prime Contractor of the Year by the U.S. Small Business Administration, Washington Metropolitan Area District Office. The Small Business Awards recognize small businesses that have achieved notable success while making valuable contributions to their communities. TCG President Dan Turner will receive the award and give remarks on May 3 at the NTSB Conference Center in Washington, DC. More information about the 2017 Small Business Awards ceremony is available at http://conta.cc/2oxGXx7. The recognition comes as a result of client nominations and will sit proudly alongside TCG’s awards as a certified Great Place to Work and Washington Post Top Workplace. With this recognition, TCG is now both a leading small business advisor and one of the best places to work for our industry’s highest-achieving professionals in the metro area. TCG leads teams under contracts such as the CIO-SP3 Small Business GWAC, GSA Schedule 70, GSA PSS, and several others. TCG employees perform 86% of all work on its contracts for clients across government. More information about the SBA Washington Metropolitan Area District Office 2017 Small Business Awards is available at http://www.sba.gov/dc.